You can see it in your mind’s eye. The perfect solution to a problem or opportunity that will move your business forward. You’re excited, energized, and anxious to get started. But you know that your biggest challenge will be the stakeholders who must ultimately approve and adopt your solution. How are you going to work with them to make your vision become a reality? 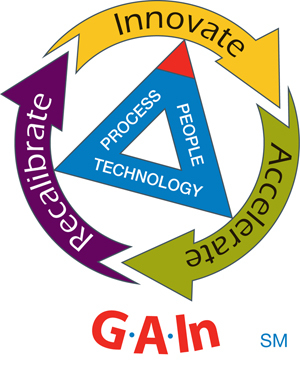 With GAInSM, the solution development methodology available only from WG Vallance. GAInSM (Guaranteed Aligned InnovationSM) is an integrated definition, design, testing, and implementation system that enables client business leaders to successfully create and deploy new business solutions. GAInSM does this by proactively managing the disruptive nature of the innovation present in every new business solution. GAInSM accounts for the technical, finance, legal, logistics, personnel, marketing, sales, executive and every other stakeholder concern that must be satisfied in order for your new solution to be adopted by every affected stakeholder. You know that your vision can only become reality if you successfully set and manage stakeholder expectations. Not only does GAInSM address stakeholder concerns during solution development, it places an intense focus on stakeholder communication during and after implementation. This focus ensures that stakeholders will easily recognize the benefit of the solution that they approved, and that you championed, virtually guaranteeing solution adoption. Read further to learn how GAInSM and WG Vallance can make your vision a reality. Ensuring that new solution innovation properly aligns with your organization’s vision, mission, strategy, and operating practices is difficult. There are multiple stakeholders who have a role to play in both the development and adoption of every new solution. Stakeholders are the most critical element of every new solution development effort. The larger the organization, the greater the number of stakeholders – which exponentially increases the difficulty of successful innovation alignment. What’s needed to solve this problem is a solution development methodology that accounts for your organization’s unique operating practices as a primary element of the methodology. WG Vallance’s Guaranteed Aligned InnovationSM (GAInSM) solution development methodology was created from the ground-up to laser-focus on ensuring that new solution innovation aligns with both operating practices and stakeholder perceptions (which can be very different from each other). The reason – to enable WG Vallance clients to gain (and widen) their competitive advantage with the development and implementation of every new solution, no matter how large or how small. Stage 1 is the time during which a new solution is defined, designed, tested, and implemented. Stage 2 is the period of time when the new solution is actively being used. During this period of time the solution accelerates the performance of that part of the organization for which the solution was designed. Solution performance is constantly measured using Key Performance Indicators (KPIs). 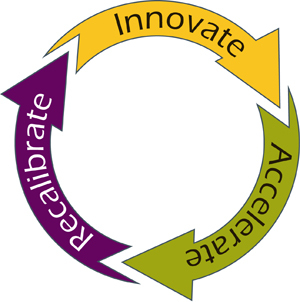 When KPIs indicate that the solution’s performance has begun to decline, the solution enters Stage 3 – Recalibration. During this period of time the solution remains in operation while an assessment is performed to determine the remaining useful life of the solution. Plans are developed to begin the development of a replacement solution well in advance of the end-of-life of the existing solution. Stage 1 begins again when development of the replacement solution commences. There is a time of overlap between Stage 3 and Stage 1 until the replacement solution has been placed into active service within the organization, at which point the GAIn Solution LifecycleSM repeats. The GAIn Solution Development MethodologySM (GAIn SDMSM) is the “engine” that powers the GAIn Solution LifecycleSM. It guides the design, development, implementation, and support of each new solution to ensure that each solution’s innovation is properly aligned with your organization’s operating practices. GAIn SDMSM harnesses your organization’s technology, people, and processes to produce GAIn SolutionsSM. GAIn SDMSM defines the specific tasks that each resource must perform, and when, within the overall solution development project. 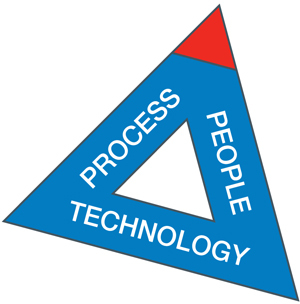 This ensures that your technology, people, and processes are always working together in a manner that will produce a GAIn SolutionSM. A brief description of each of the GAIn SDM PhasesSM is listed below. WG Vallance utilizes its GAIn SDMSM with every solution it develops. GAIn SDMSM is unique to WG Vallance and only WG Vallance clients enjoy the benefits of GAIn SolutionsSM. Defines the approach that will be used to conduct the solution development project. Obvious stakeholders are identified. The impact of the solution on the organization is estimated. Work Plans for Current State and Future State definition are finalized. Defines the desired GAIn SolutionSM as it is envisioned to exist once it has been completed and becomes operational. The desired business and technical environments will be documented in addition to project feasabilities, boundaries, risks, and risk mitigation strategies. A project management approach will be documented and a budget forecast will be prepared. The SOW for the remainder of the project will be prepared. Documents the existing business and technical environments, including technology systems, technology processes, and environmental factors. The effect of the Future State Vision upon existing people and operating practices is documented. Short term solutions to challenges discovered during this Phase that would impact the successful completion of the project are developed and documented. The requirements for the GAIn SolutionSM are developed. Future State functional and technical requirements are determined and documented. An assessment of the expected functional and technical impacts that the Future State GAIn SolutionSM requirements will have upon existing technology, people, processes, and operating practices is documented. Final GAIn SolutionSM requirements are approved. The GAIn SolutionSM is designed. Mutiple possible solutions are investigated and narrowed to a final GAIn SolutionSM. A prototype of the final GAIn SolutionSM is developed and tested in a lab setting. The prototype is then run through a formal Proof of Concept Test to validate that it meets 100% of its design requirements. The complete set of documentation for the tested and approved GAIn SolutionSM is completed. plan, or training program. The GAIn SolutionSM documentation is updated with the learning obtained from the Pilot Test. Implementation risks are identified, and a risk mitigation plan is developed. 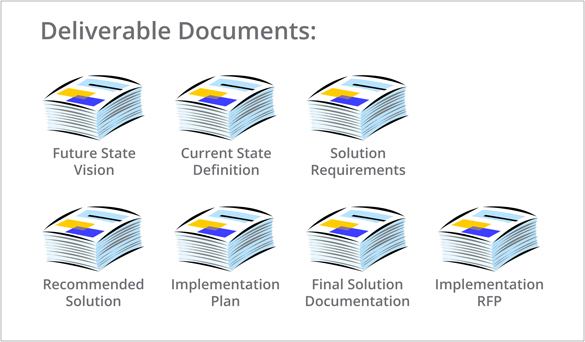 Implementation strategy, management, and logistics are documented in an Implementation Plan document. WG Vallance prepares an implementation Request For Proposal (RFP) for the client. Copyright 2018 WG Vallance. All rights Reserved.